Poland’s opposition conservative Law and Justice party (PiS) has claimed a stunning victory in Sunday’s parliamentary election winning enough seats to govern alone. Run by Jaroslaw Kaczynski, the twin brother of Poland’s late president Lech the eurocosceptic PiS has unseated the incumbent pro EU Civic Platform after eight years. 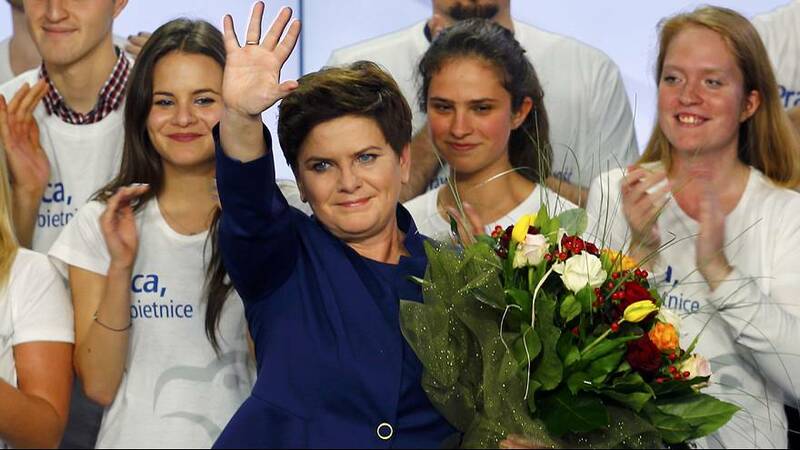 The woman destined to become prime minister is .Beata Szydlo. Poland’s swing to the right risks putting the country on a collision course with its key EU allies. Only three other parties are expected to have seats in parliament: the Polish Peasants’ Party, and two new groups, a right-wing party led by rock star Pawel Kukiz and the pro-business Modern Poland. Distrustful of the EU and an advocate of a strong NATO stance in dealing with Moscow the PiS opposes joining the euro zone any time soon and promises more welfare spending on the poor. Poland and refugees. Where is the Solidarity?